Since 1979, the MFTHBA has been proud to host this event every June. Each year, Fox Trotters compete in more than 75 varied classes including performance, model and versatility. 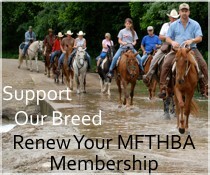 In addition to the activities in the show, the MFTHBA hosts several National Trail Rides and a Youth Seminar. The highlight of the show ring activities is the Three Year Old Futurity competition. Fox trotters compete in Open, Open Amateur and Amateur Owned and Trained competitions. Entries are vying for their share of $25,000 in cash prizes. A unique aspect of Futurities in the Fox Trotter performance ring is that not only are these horses competing for money, but that they are entering the show ring for the first time under saddle. This allows the Futurity to not only test the horse’s ability to perform the flat foot walk and fox trot to the breed standard but also highlights the breed’s excellent disposition and willing attitude. “These young horses will be experiencing their first show when they enter the ring on Thursday night. It is a testament to the willing disposition of the breed that they respond so well. Our members put a great deal of work into preparing their horses for this event,” said Joyce Graening, MFTHBA President.